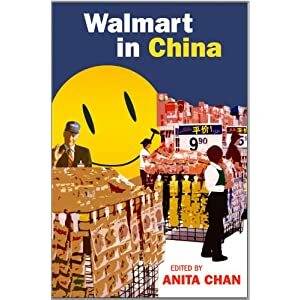 The first is “Practicing Cheer: The Diary of a Low-Level Supervisor at a Walmart China Store,” which appears in Walmart in China, an edited volume from ILR Press (an imprint of Cornell University Press). Practicing Cheer is an English translation of the diary of a Walmart employee in China. It appears alongside an introduction coauthored by Professor Myers and Anita Chan, the editor of the book. The second publication is an excerpt of Scott Myers’ English translation of Beijing Comrades, a contemporary Chinese novel by Bei Tong. This translation appears in the current issue of UCLA-based Amerasia Journal. Written in 1998, Beijing Comrades is mainland China’s first modern gay novel as well as its first e-novel. This translation is also preceded by an introduction written by the translator (Professor Myers). Congratulations to Professor Myers for these accomplishments. This entry was posted in Interpretation, Translation and tagged faculty publications on October 28, 2011 by Jeffrey Fowler. This morning in Boston, Professor Holly Mikkelson was honored by the American Translators Association with the prestigious Alexander Gode Medal. The Alexander Gode Medal, as stated on the ATA website, is “ATA’s most prestigious award, is presented to an individual or institution for outstanding service to the translation and interpreting professions.” The award can be given out annually, with last year’s recipient being Glenn Nordin. The Institute, and particularly those in GSTILE, would like to extend their warmest congratulations to Professor Mikkelson on this amazing accomplishment. This entry was posted in News, Translation and tagged award, faculty, Translation on October 28, 2011 by Adam Garnica. Can’t find time in your busy schedule to attend the Institute’s Found in Translation series? The Monterey Institute is now posting videos of recorded events on the Found in Translation website, free of charge for everyone to watch. This semester we’ve already had Professor Julie Johnson speak on mental conditioning for interpreters, and Kent Johansson speak about translating in the Eurpoean parliament. Both talks are up on the Found in Translation website now. On November 1, Professor Aida Martinez-Gomez will be giving a presentation entitled “Community interpreting for less visible communities: An international overview of interpreting in prison settings” at 12:15PM in Irvine Auditorium. We look forward to seeing you all there. If not, be sure to catch the recording online. This entry was posted in Found in Translation Series, Interpretation, News, Translation and tagged Found in Translation, Interpretation, Translation, translation and interpretation on October 28, 2011 by Adam Garnica. MIIS Professors Present at Foreign Language Association Conference! Our very own MIIS professors Pablo Oliva and Vicki Porras presented at The Foreign Language Association of North Carolina Conference in Winston Salem, NC on October 13th and 14th. The topic of their workshop was content based instruction: the use of authentic materials, scaffolding activities and assessment in the foreign language class. Examples of activities were drawn from graduate school and summer intensive language programs (Spanish). This entry was posted in Uncategorized on October 25, 2011 by Jeffrey Fowler. The ATA 52nd Annual Conference will be held at Marriott Copley Place in Boston, Massachusetts from October 26th-29th 2011. More than 1,500 translators, interpreters, project managers, and company owners will attend ATA’s 52nd Annual Conference. The opportunity to network with this many colleagues only happens once a year. Don’t miss it! Register now to SAVE! Fees increase 17% on OCTOBER 15. This entry was posted in Translation & Interpretation on October 13, 2011 by GSTILE.